Good Bathroom Ideas make your bathroom appealing and attractive with a little imagination and plan. If you’ve always envied folks’ who flaunt their bathrooms and snazzy bathroom accessories, it is no more a great deal. Although, bathrooms have become more stylish and contemporary, prudent use of space and sophisticated fittings can transform the smallest bathroom into a glamour room. 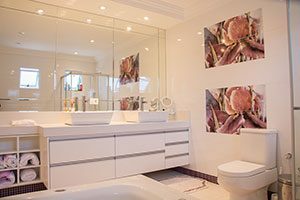 When you are executing your bathroom ideas, you need to use the space wisely and keep the fixtures and fittings in proportion to the size of the room. If you are fitting a small bathroom, there are sinks designed specifically to suit the purpose. Ceramic is by far the most sought after and affordable material used in the manufacture of sinks, and it is the most hygienic and durable. Provided you take good care of it, it will still look as good as new even after a decade. Stylish alternatives such as glass or steel will need more work to keep them looking good. Stone and marble may look fantastic but it will definitely blow the budget. While many bathrooms have laminate or solid surface countertops, tiles of all shapes and styles are the pick of the day. For any variety of looks and durability, choose glass, ceramic, stone or metal tiles. You can also scatter hand painted or embossed tiles at intervals on a wall to create texture and color. At present, bathroom taps for sinks and showers come in a variety of shapes, materials and designs to choose from. Although they look expensive, they fit most bathroom budgets. The popular bathroom budget taps are made of steel while some look elegant with ceramic knobs. If your bathroom is small and you want to save on space and money opt for a bathtub fitted with shower instead of separate shower cubicle. Don’t overlook the easy, low cost bathroom ideas .For instance, decorative touches such as new window treatments, colorful shower curtains towels and bath mats, or even basic items like soaps and candles will create a whole new look. Cut the clutter. Install a glass shelf on a wall to keep the counters clear .The shelf can be used to hold functional bath products or decorative items like picture frames or votive candles. Many bathroom shelves are available to complement the finishes to bath accessories and taps. placed in a dry corner. Bathroom can be made appealing with attractive flooring. Make sure that your bathroom has non slip floor tiles for safety purpose. Ceramic and stone tiles have become popular for bathroom flooring. This is low maintenance material and is perfect for bathrooms. They are available in a variety range of colors. The monotony can be broke by using contrast borders. Go in for a throw rug instead of thick carpet to add color and warmth to the bathroom interiors.Anti skid cotton bath rugs are also a good option. Thus, with innovative bathroom ideas, you can accessorize your bathroom in an inexpensive way.